Yesterday morning, one of my Facebook friends posted a picture of a softball glove and noted that he had not played for four years but was on his way to play. 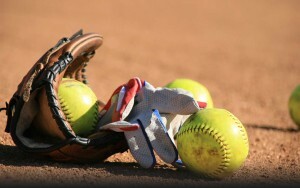 That got me to thinking myself – I haven’t played organized softball since about 2005. That year I blew my knee out and had to have an operation on a torn meniscus. I also had three daughters get married within eight weeks of each in three diverse parts of the country. In 2002 I coached the team that won the Lexington church league championship and had some good ball players on the team. I was the pitcher. I was an excellent hitter as well and always hit late in the lineup so that I could knock people in that were on base. But I was not a very fast runner at 400+ pounds. News article about Murray 20th Ward Softball Team in the “Church News (published by the Deseret News)” of Sept. 6, 1975. We were multi-region Champions. I was interviewed for this article as a convert member of the team. I have played baseball or softball every since I was in elementary school. Playing the game was always my favorite sport. 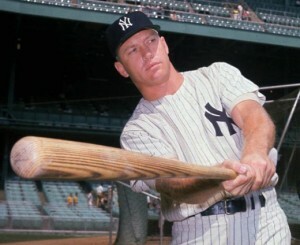 Mickey Mantle was my hero back in the 1960s. In every softball league I played in I wore his #7 on my jersey. I even had the opportunity to meet him in Dallas in 1965 or 66. In the mid-1970s I played on a church league team for young adults (see article above). It was a Mormon softball team and in those days in Salt Lake City they had what they called multi-region tournaments where teams came in from Nevada, Idaho, all across Utah and some even from Wyoming. Our team qualified for the tournament hands-down, and ultimately won the tournament hands-down. I was not a starter on the team but I played a lot and it was fun to be on a winning team. Over the years I developed a pension for softball pitching and I was always a pretty good pitcher (at least in my own mind). I could read batters and I knew how to place the ball. 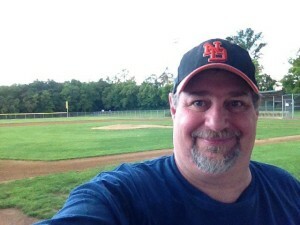 I can still pitch when my knee allows me to, and I even pitched in a one day church tournament in 2013, but I was not able to run the bases at all due to knee issues. So, I dream of going out again and playing softball and as I get this weight down and build my strength up, it is my hope that I will be able to do it again and hopefully be playing in my 60s!! Yesterday was a good day. I had planned to walk in the morning but was tired from a late night helping my wife with her homework. 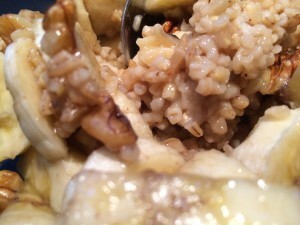 But we started the day off right with a good bowl of steel cut oats with bananas and walnuts for breakfast. 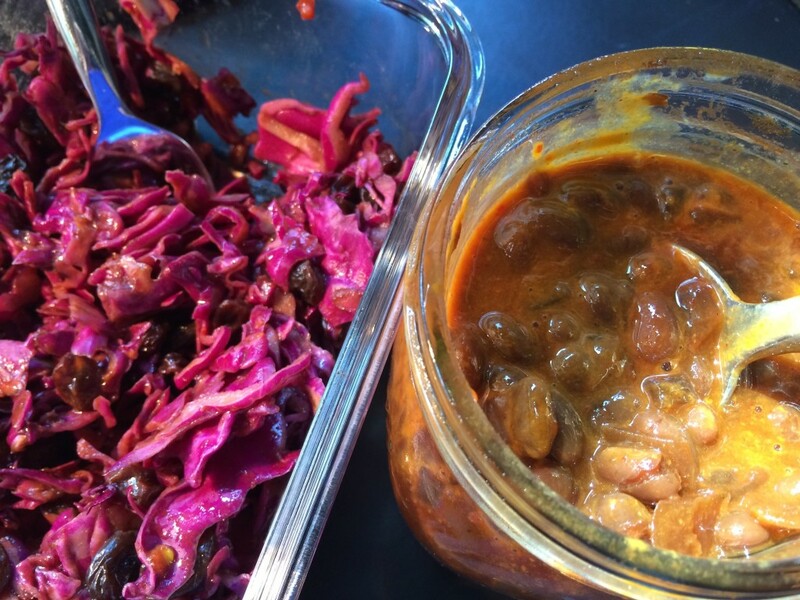 I then had a great lunch of vegetarian baked beans along with a very nice purple cabbage and raisin slaw made with Julianne’s 3-2-1 dressing. Wonderful lunch. And it was filled with lots of healthy PlantPure goodness! But the highlight of the day was getting my walk in the evening and walking 1.95 miles. This is the furthest that I have walked without stopping to rest since I participated in a 5K event a number of years ago. 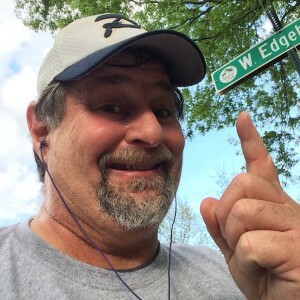 I added extra distance on the course hoping that I would get to the 2 mile mark because I desperately want to do a 2 Mile Smile picture. But, I did get my Smile at a Mile picture as can be seen on the left. 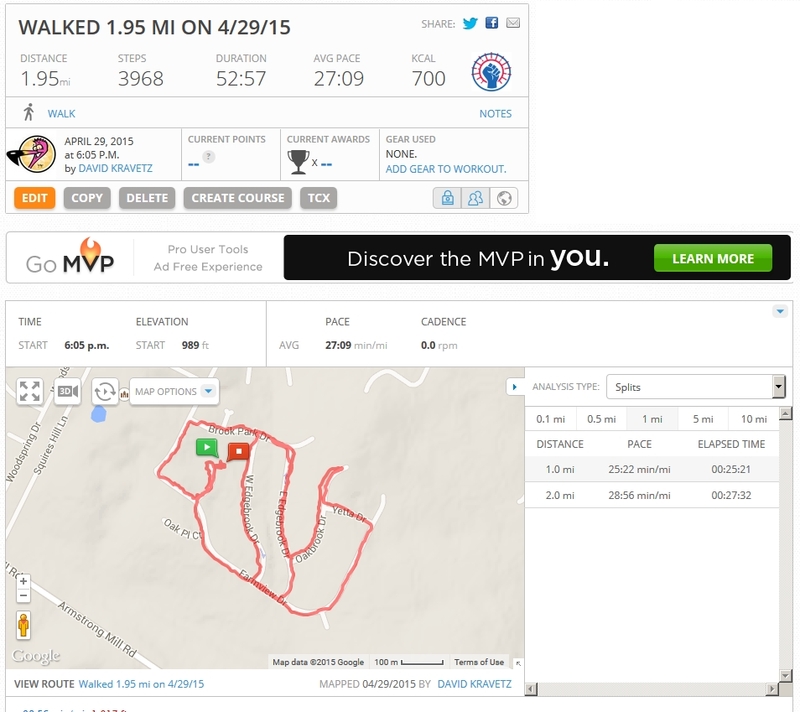 MapMyWalk for Apr 29. Almost got to 2 miles! 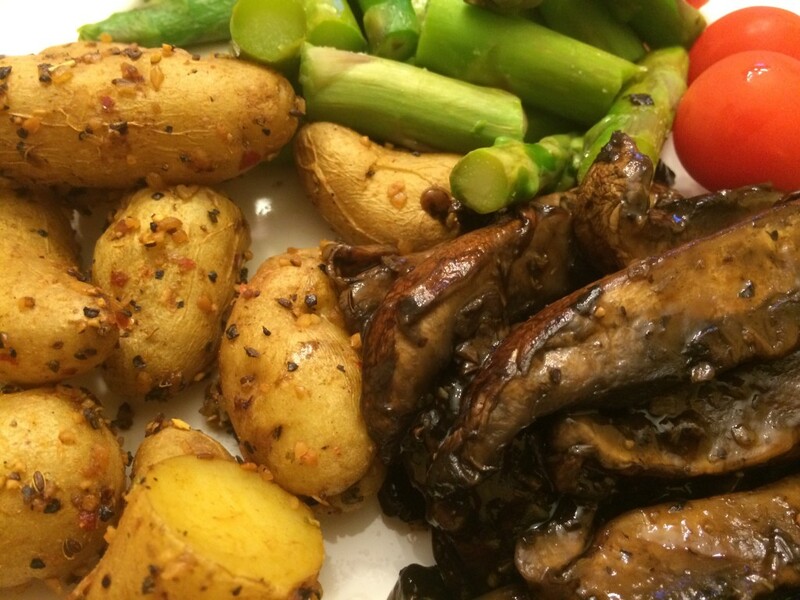 After the walk and a brief rest, Julianne made a simple but absolutely phenomenal dinner with sauteed portabella mushrooms in a nice gravy (tasted like beef stroganoff!! 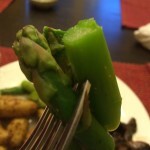 ), luscious, almost buttery asparagus and some fingerling potatoes with salt and garlic. Wonderful dinner. This was a 15 out of a possible 10!! I to want remind all my readers to come join Team Sumoflam at the Great American Fitness Challenge in Lexington, KY on June 13. The discounted rates are only good until May 8 and then they go up. A few of my Lexington family and friends have said they would come join me, but only one has registered so far. to remind you, it will be held at the beautiful Kentucky Horse Park and features a 5K, a 15K, an Open Steeplechase and an Elite Steeplechase. You can register by clicking the link below. Anyone that participates on Team Sumoflam will get a specially designed t-shirt with artwork by singer/songwriter/artist Antsy McClain. Hi Dave! I am not hallucinating (for once), when I tell you that I am seeing your face changing over the last few weeks : it’s starting to show! You are going to do this thing, I am sure of it. Oh yes…there are more changes that are yet unseen. But they are there. Thanks always for the continued encouragement and good mojo! You rock Kari! !